Pitch the Obi Wan spinoff! That does give me an idea - What if someone re-scored the OT to incorporate PT themes that didn’t exist at the time like […] Battle of the Heroes for the Obi-Wan/Vader duel, etc.? Too crazy? Adywan actually did that in Revisited. Let’s say that Lucas put something in his contract with Disney that they had to include at least one character or location from the Prequel Trilogy in the Sequel Trilogy. Which character/location would you prefer that they include? It’s supposed to look like an anime but it’s made in America. Does anime have to be Japanese? There is a theory out there that Rey is the reincarnation of Anakin Skywalker. What do you think of it? How would you feel if they went through with it? Reincarnation is a concept that has never been explored in the Star Wars universe. I refuse to read this post until you take down the mutilated youtube version of my edit that you posted without permission. Delete this post. Not the thread, just this post. The Clone Wars/Rebels executive producer Dave Filoni also worked on Avatar: The Last Airbender, which revolves hevily around reincarnation, and they have confirmed that they are bringing a character from TCW into Rouge One. Different Star Wars projects get ideas, stories, and concepts from each other, so I believe that Avatar, deliberately or not, has brought a new concept to Star Wars. I’ve posted this entire fan edit to YouTube. 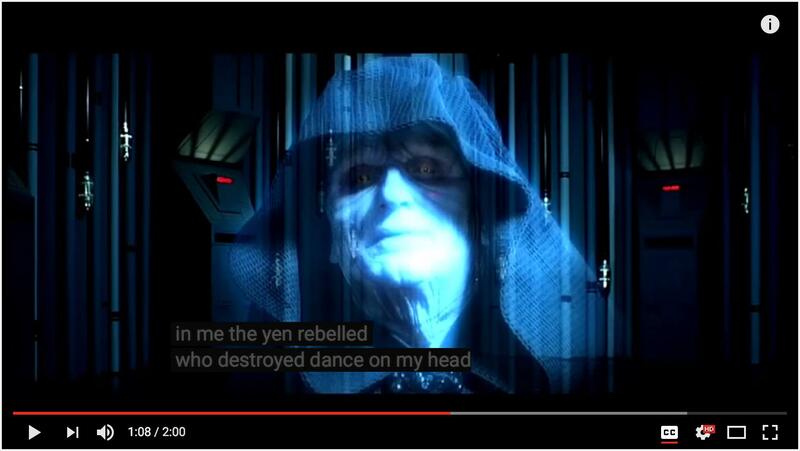 Most of the entertainment value I get from the prequels comes from their very badness. The only times they’re ever any fun to watch is when you’re with a room full of people making fun of them, and any edit that aims to salvage them as sincerely good films that isn’t a complete failure necessarily sacrifices much of that so-bad-it’s-good value. You should try Frink’s, his edits are nothing but nonsense. You said that it was declared “off canon” before Disney bought it. Sorry but I cant’ take it seriously. You don’t seem to understand how dumb your way to ask questions is. Oh gosh, I think I’m gonna stay away from forums a few more weeks. It seems strange to skip all prequels, but they are inherently flawed even if they are enjoyable and improved by fans. The original trilogy thrived on its mysteries. When the Clone Wars was spoken of by Luke and Obi Wan, the reference was organic. The characters acted like if events in a universe were real and the Clone Wars were organically left unexplained and to the imagination. If they explained it, it would be like two adults explaining World War II to each other mid-conversation. The world was immersive and seemed real. Darth Vader is the ultimate example of less-is-more. The character is so evil that it is extremely difficult to give him both good motivations, agency, and a role as a protagonist, but we do see how deeply he was affected by his past. He’s a half machine monster who could not believe in himself, refers to himself in the third person, and attacks his own son. If the movies were released chronologically, there would not be any problems like this and the prequels could be viewed, but they weren’t. This edit doesn’t show the Clone Wars, and doesn’t really feature Anakin as a protagonist. I just got back from a long roadtrip and one of the places I wanted to visit was Death Valley. Very cool place if you like the outdoors. But, it also was the location of several filming locations of Star Wars and Jedi. I so wish I couldve been about 11 or 12 instead of my age now. But alas, im older now and it still was very neat to actually stand on Tatooine, so to speak. Ill add some more pics later, but heres one place I visited. After looking at the photos, I realized the actual shot was a bit further to my left due to the angle of a few of the peaks in the distance. But, I was still there. 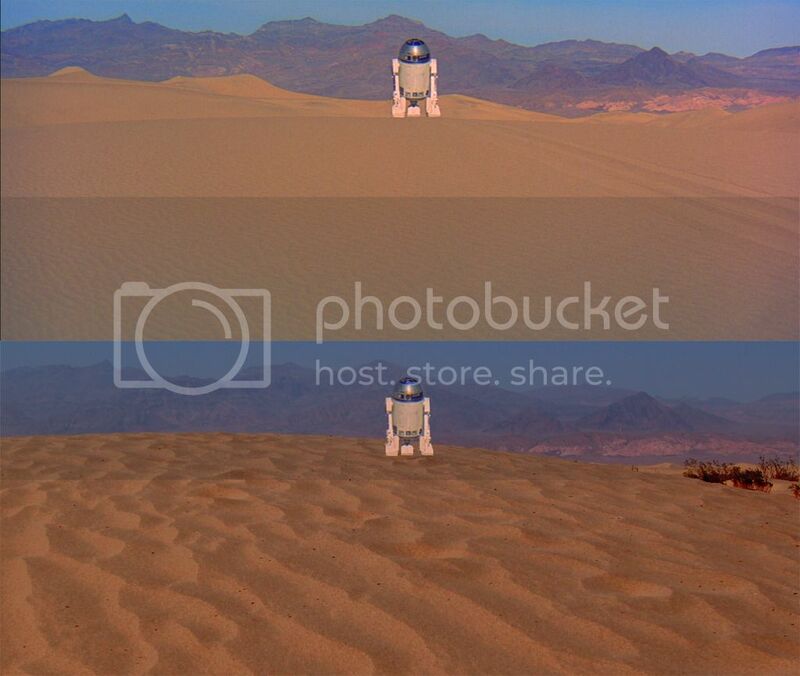 I cut and paste Artoo just for the heck of it into my photo. I tried to adjust the color to closer match the actual movie. If any of you ever get the chance to go out there, it is a very neat park to visit. Most folks dont care about going there because of the heat, but its tolerable and a very, very cool place to explore. There are very view people there, so you pretty much have free reign of the place to do as you please. Just make sure you have a reliable vehicle though. Getting in and out is really hard on your car. The temps range quite a bit too. At the Mos Eisley overlook, it was 84 while down in the valley, it was 118! Also, the one thing to consider is that the dunes are ever changing, and it has been 40 years since this scene was filmed. So you have to do a little exploring to find the dunes that match the shot as close as possible. The sand got worse with time. With regard to Rogue One; I hope he isn’t in it at all. And yes, I realize that’s very unlikely. If he is, I’ll be glad if it’s just a scene or a name-check. I’ve never found him to be interesting. Not when I was a kid in 77, not in the 80s films, not now. A movie without him would be just fine with me. Perhaps this will change your mind about him. I meant when was it declared non-canon? I’m pretty sure it was still canon when the first bunch of episodes of the CGI series came out. An interview of Dave Filoni can be found somewhere in which he declared he loved and respected the original show and that the CGI version was a sequel not a remake (it was before the new show was aired I guess). In fact I don’t think the first series has been officially declared non-canon by Lucas and Lucasfilm, they just stop mentioning it during the release of TCW ze movie, and then they erased it from the website and stoped producing video releases of it. Curiously the second show has never dealt with the same exact time era of the first series (Anakin is already a Jedi Knight in the second show, and it ends before Anakin and Obi-Wan were sent for a mission in the Outer-Rim territories that last months), so both can co-exist without too much continuity issues. It finally was officially declared non-canon by default when the “great reboot” was triggered in april 2014. If someone can find something official, like an interview of GL where the conflict between the two series is mentionned, could be useful ! I don’t think you understand how lists work.